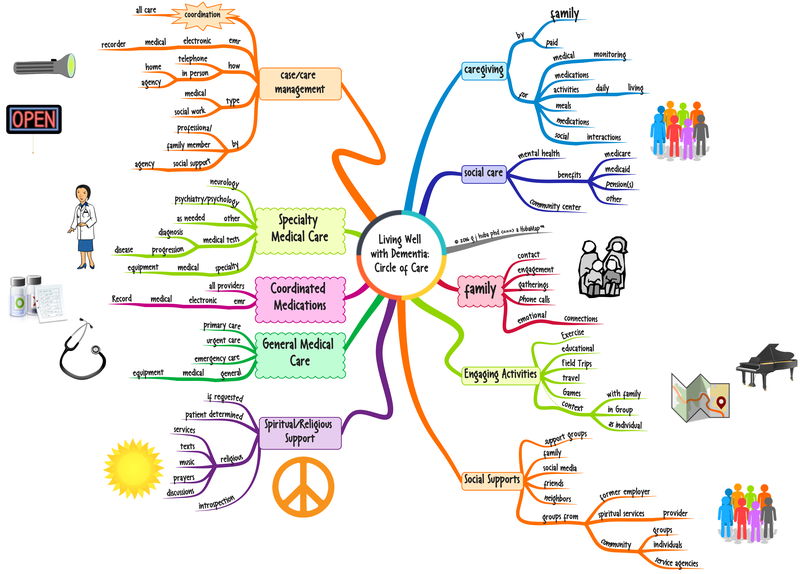 This mind model (aka mind map) below shows a “Circle of Care” for persons successfully living well with dementia. The ability to access such a network when needed is a goal that the healthcare and social care systems should strive to attain. While this may appear to be a daunting task, remember that most of these services exist in some form in most places but in most instances are not coordinated nor aware of the contributions of other sources. The key to making the “system work” is successful (care or case management) of the individual. What is the Quality (Accuracy, Validity) of the Content in the #Biggerplate.com #MindMap Library? Do healthcare programs work as well as they might? Do socialcare programs work as well as they might? The Plan [Home Sweet Home] | ALL BLOG POSTS | Me | Me 4.05 | Stuuff: Random/Changing | Social Networks + Information Curation | Intro 2 Maps | Maps of the Mind | Map Quilt | Sketchnotes & Photonotes | Tunes/Flicks | Top 100 Twitter Psychologists | Top 100 Healthcare Accounts for Professionals to Follow | Ultimate List of Social CEOs on Twitter | Best Known for Healthcare Tweets | Best Known for Health Tweets | Best Known for Psychology Tweets | Best Known for Mind Mapping Tweets | PeerReach | Healthcare Administration Resources | Content Rating of This Blog (and User Responsibilities) | Backstory (Archival, Specialized, Technical, Personal Interest) | Hubaisms.com >>>Table of Contents<<< | TestOnly | Blog at WordPress.com.